Despite bad news about layoffs and cut salaries, Faraday Future still is producing decent video teasers. The latest one is entitled Always in Motion and shows us progress with the development of the production version of FF 91, now scheduled for 2019. The more important news is that the company released an update about its clash with major investor Evergrande Health Industry Group Limited (Evergrande). 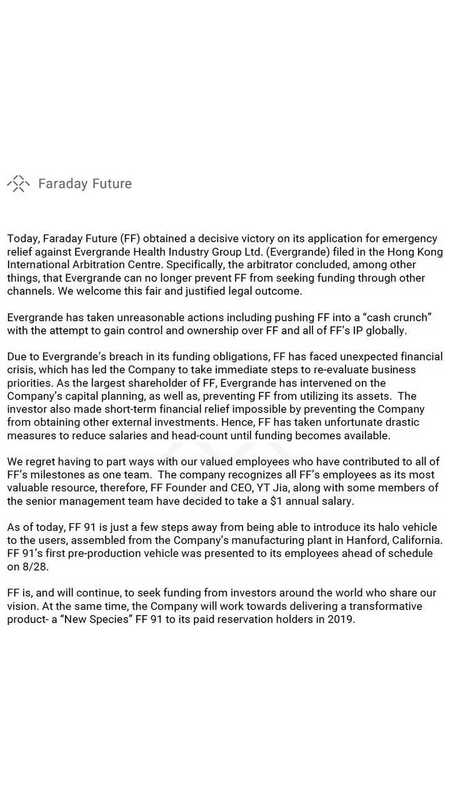 According to FF, Evergrande didn't provide the full promised amount of money, while at the same time it blocked the company from seeking other investors. The arbitrator concluded that FF can no longer be prevented from seeking funding. "Today FF achieved a decisive victory on our emergency relief application. FF is, and will continue, to seek funding from investors around the world who share our vision."